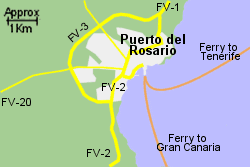 Map of the Puerto del Rosario Ferry Port area. 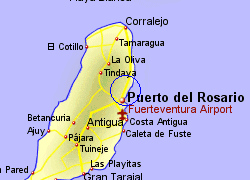 Puerto del Rosario is the capital city of Fuerteventura and the main port for the island, located on the east coast, approximately 4km from the airport. The port is important for movement of cargo into and out of the island but also caters for passenger ferries and now also for visiting cruise liners. 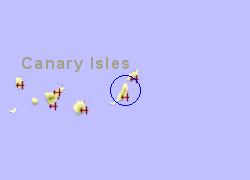 The trunk roads, FV-1 to the north and FV-2 to the south, give good links between the city and the all the east coast of the island, with the northern tip accessable in just over half an hour and the southern tip in an hour and 20 minutes by car. 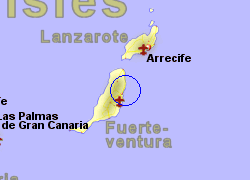 Regular bus services also run to other parts of the island. Operated by Armas with upto 5 crossings per week, crossing time 7 hrs 30 mins. Operated by Armas with upto 5 crossings per week, crossing time 10 hrs 30 mins. Operated by Fred Olsen with 1 crossing per week, crossing time 1hr 20 mins.